Before long, the pastor from Crosby UMC learned all about the Black Sheep Ministry, a Gospel for those who prefer two wheels and Harleys. 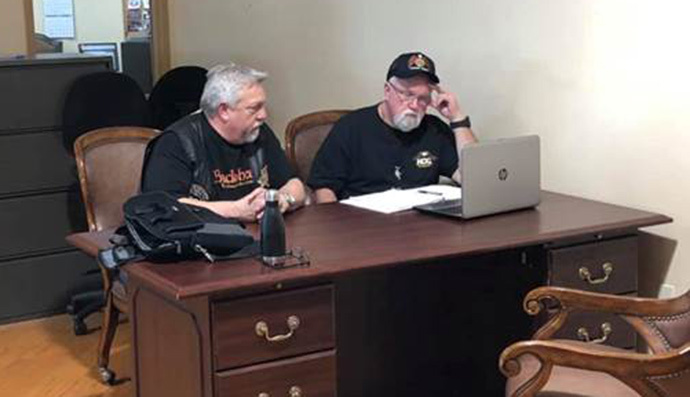 The story behind the 20-year old motorcycle ministry also spoke to the pastor, who now serves as president of the organization’s Texas Gulf Coast chapter. Edwards did not know much about motorcycles. So, when he was out riding one day and got a flat, he called the dealership to come fix it. A young man named Michael Butters arrived with a truck to retrieve the bike for repairs. While the two drove to the dealership, Pastor Edwards felt called to speak to Butters about Jesus. Still, he felt too intimidated and decided to stay silent. About a week later, Butters died in a tragic vehicle accident, and when Edwards heard the news, he called the dealership. Owner Rich Quaid told the pastor that his employees were devastated by the disaster and asked for spiritual guidance. Edwards rushed to help, praying with everyone at the dealership, comforting them during their time of loss. The pastor vowed to never let that happen again. “He’d never miss an opportunity to minister,” Lea said. 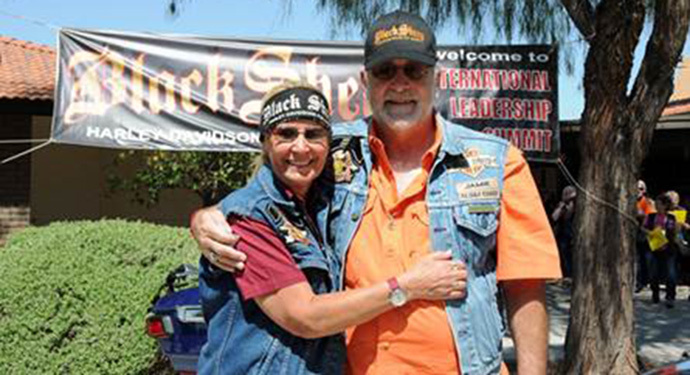 Black Sheep was born, directly serving Harley Owners Groups (H.O.G. ), which counts millions of members worldwide. The group’s goal is to take the Gospel where it might not be well known or where disciples otherwise might not be served. 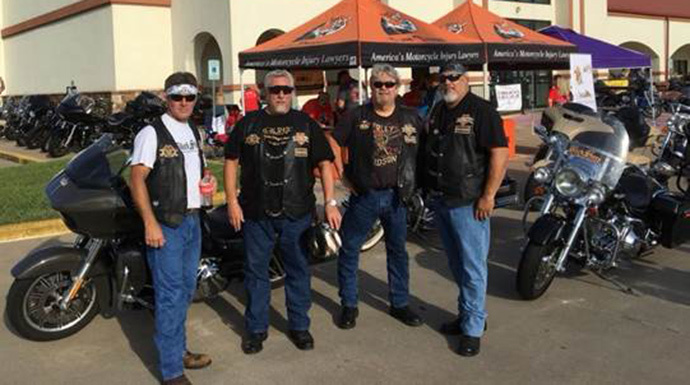 Instead of waiting for Harley riders to come to church, Black Sheep members go to them. 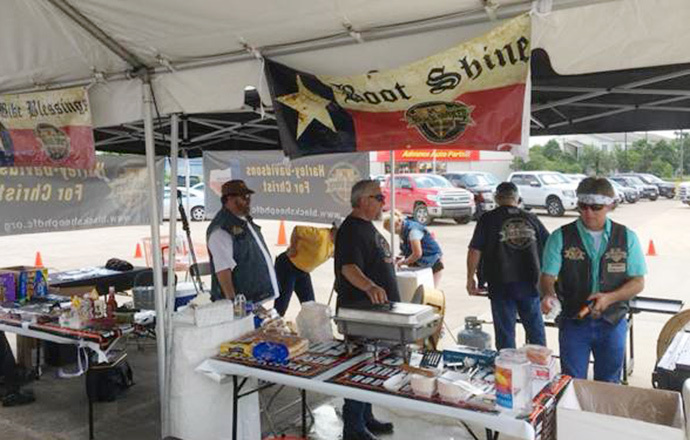 They park bikes at the dealership and flip burgers at biker events. They like to offer free boot shines, which they compare to Jesus washing feet. 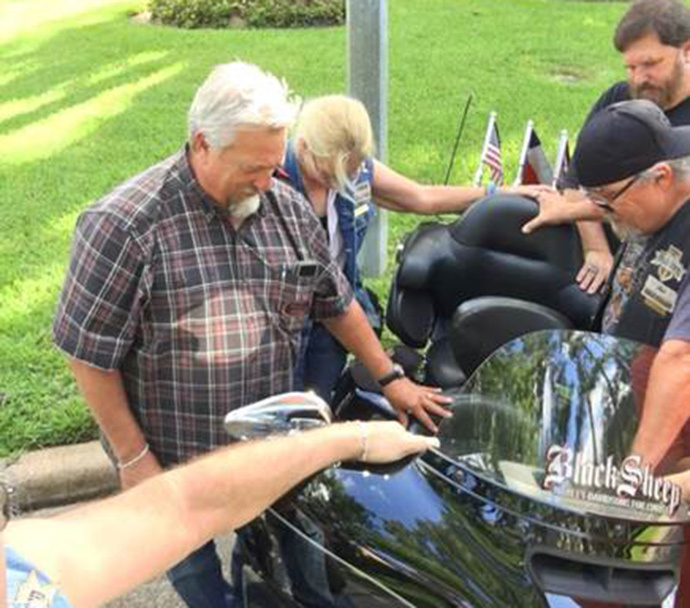 They bless motorcycles and their riders and pray with them. Lea and his Black Sheep ministers also now help at weddings and funerals for the H.O.G. community. “We’re part of the scenery until they need us,” Lea said. The Rev. Jim Love, associate pastor for Bellaire United Methodist, also serves as regional director for Black Sheep, covering Texas, Nebraska, Kansas and Oklahoma. He said a growing number of men and women are joining the motorcycle ministry. Sometimes, the most unlikely characters appreciate their prayers the most – and thank the pastors for their blessings. The Bible refers to times when Christians were outcasts, Pastor Lea added. He said that bikers too are often seen as black sheep.